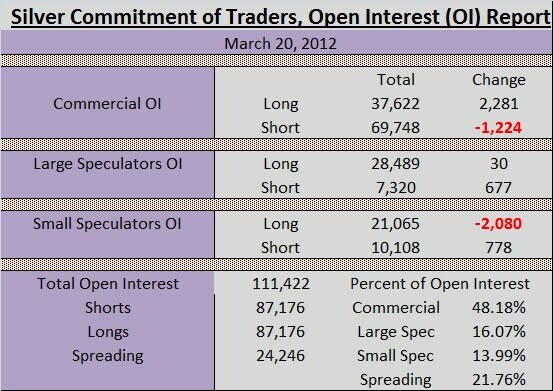 In what should come as absolutely no surprise to any of SD's readers, the commercials reduced their short silver futures positions a net 3,505 contracts (17.5 million ounces) in the week ending Tuesday 3/20/12. The commercials' position now sits at 69,748 short contracts, offset by 37,622 longs, for a net short position of 32,126 contracts, or 160,630,000 ounces. In last week's 3/16 COT report, we reported that the commercials had only covered a mere 825k ounces in the week ending 3/13, meaning either that further raids were planned by the cartel, or else the bullion banks would have to cover into a price rise. Clearly, further raids and suppression in order to cover a portion of their massive recent increase in short holdings is what has occurred. At 160 million ounces, the bullion banks are still net short nearly 60 million more ounces than at the beginning of 2012. While silver sentiment is currently near an extreme nadir, this bodes extremely well for silver's prospects for the rest of 2012. 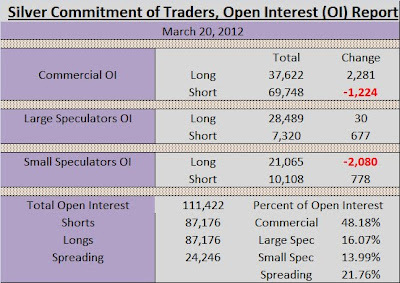 In a sign that the bottom is near in silver (if not already placed on Thursday at $31), the speculators added 677 new shorts and only 30 new longs, for a net short increase of 637 contracts (3.2 million ounces). As the speculators nearly always get it wrong and chase price into rallies and corrections, such drastic new shorting by the speculators combined with major overall bearishness and despair among silver investors indicate that silver is extremely close to a bottom if one has not already been placed.